Representing approximately 300 Swedish independent record labels. The Swedish indie companies account for about 80% of the Swedish record release. Meanwhile, the independent companies in many cases little or no media attention. SOM, in collaboration with Marie Lundvall and Peder Bjoerk the member company The Sublunar Society, a collection of genre-specific playlists on Spotify. Initially there are 12 lists in various genres, from pop and rock, electronic and club music, to folk, classical and children’s music. The lists will be updated once a week. Thus, menus always be very latest. To take note of the music, click the Spotify link below. The channels to get the music have become narrower and more, while the background noise is getting higher. 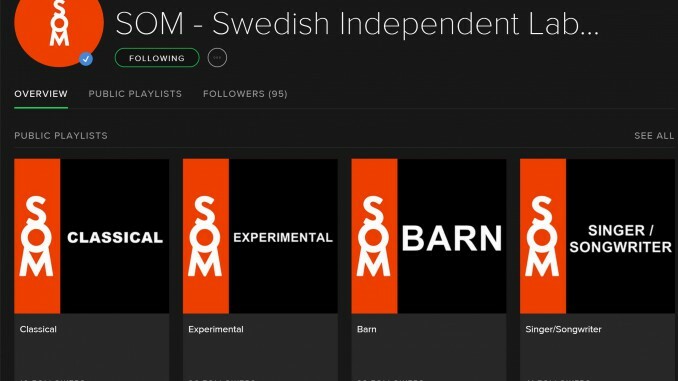 To give consumers a way into the good, new music and to collect all placed on the SOM companies in an easily accessible place, here as in cooperation with Peder Bjoerk and Marie Lundvall on the member firm The Sublunar Society gathered some of the past two years releases of genre-specific playlists on Spotify. – There are twelve lists in various genres, from rock and pop, club music, to classical and children’s music, and more, says Peder Bjoerk. Everyone that companies can participate in the relevant list, with one track from each release. Each AS-affiliated company can add a song from each new release. The idea is that playlists will help to make it easier to showcase the music that is published in independent music. The discs are published in Sweden, nearly 80 percent of independent companies. – The idea has been around for a few years. The independent companies have in many cases little or no media attention, says Peder. – At the same time indies a clear majority of the Swedish emissions – and is an indispensable part of Swedish musical life. These lists make it easier for the interested public to monitor what the independent companies release and find new music. It is also the hope of the charts, continues Marie. – Sure, to reach the main issue here. Many small companies have difficulty in reaching the audience with his music for several reasons, including economic. SOM companies represent a large part of our indies – such companies have a voice is simply highly topical, says Peder. Check Out The Biggest Movies of 2016!